Yugster opened to the public in 2006 and is located in Salt Lake City, UT. Deals are available for purchase for 24 hours, but of course if the items sell out before that, you are out of luck. Yugster offers 6 deals: a main deal, Plugster's pick, yours until gone, sharp or shinny, today's watch, last chance and special offer. Yugster also has a YugPoints system that allows you to earn points on purchases that you make on the site. These points can later be used to get additional discounts off the already reduced 'Yugster price'. 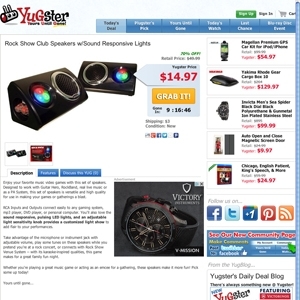 Yugster.com currently ranks #58 amongst sites offering online deals -- Pricefalls ranks #57. In the General Merchandise category, Yugster ranks at #28 -- Pricefalls.com again ranks slightly higher at #27. Amongst all deal a day sites, Yugster ranks #8 -- Steepandcheap ranks #7.